The perfect companion for a picnic, beach day, or social gathering, it's a sophisticated way to fill, transport, share, and enjoy the finest brew. if ordered by 2:00 pm EDT Wednesday April 24th. 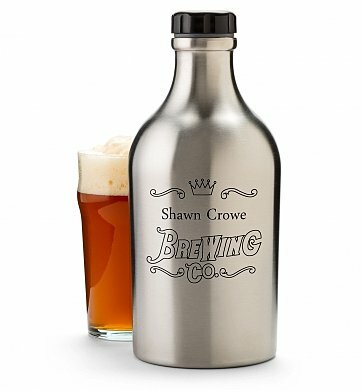 Stainless Steel Beer Growler is a hand delivered gift. These gifts are delivered by one of our local design centers located throughout the United States and Canada. Same day delivery is available for most gifts when ordered before the cutoff time. The cutoff time for Stainless Steel Beer Growler is 2 PM in the recipient's time zone. Heavy stainless steel construction to protect precious cargo. Easy handhold to tip and fill at a comfortable 45-degree angle. Looks and feels great. Order came quickly and well protected during shipment. This was a gift for my husband, a home-brewer. It is a quality growler, and he was pleased with it. I bought this for a customer..he LOVES it!! it also arrived a day early!! The engraving on it was great - I was afraid it was going to be "cheesy" ...Thank you guys so much!! I will be ordering from you again, for sure!! I recently ordered this for a friend and discovered upon its arrival that it had barely been engraved. Upon reporting this to customer service, the representative took immediate action to resolve the issue. Not only was she quick to apologize and look into the issue but she was also quick to resolve it. The following day I was informed that they had recently replaced the engraving tip and already had a replacement growler in the works. From start to finish it took less than three days to have the problem resolved by having a new growler in hand. While I was not pleased with this mishap, the GiftTree customer service rep. was very friendly and helpful. She made certain that the issue was resolved as quickly as possible and the end product made a great gift. I have to say that my rating is actually a little higher than what it would have been simply due to the great customer service, which is becoming increasingly difficult to find. Very good quality- solid cap and engraving professionally done! Very pleased and I'm sure our older sons will enjoy! Very light and super quick delivery! My cousin loved this gift! Besides having his name on it... his club doesn't allow glass by the pool.... so just perfect. Thank you. Buying for men is always difficult. Buying across the ocean even more so. I was therefore so pleased to receive an international SMS this morning from my friend saying thanks so much, he loves the growler, and that I am a champion. That feels good!